Many of the NFL's 32 franchises have reached the halfway point in their respective 2015 seasons. The games continue to fly by as the injury report grows by the week. Unfortunately, week 8 brought on another wave of frustrating injuries that will affect franchises and fantasy football rosters alike. In addition to a couple of significant season-ending injuries, week 8 brought on a new batch of nagging ailments that will need to be monitored throughout the days ahead. Week 9 gets underway on Thursday night as the Bengals and Browns do battle in Cincinnati, and we'll get you up to speed on all the latest information in this week's fantasy football injury report. - The Steelers finally welcomed Ben Roethlisberger back into the fold in week 8, but were unfortunate to lose RB LeVeon Bell to a knee injury. Bell reportedly has a torn MCL, and will soon be placed on season-ending injured reserve. DeAngelo Williams will pick up the slack in the backfield, just as he did while Bell served a two-game suspension to start the year. It's a tough loss for a Steelers squad that managed to tread water while Roethlisberger recovered from a knee injury of his own. - Bears' RB Matt Forte suffered a knee injury in week 9. The Bears believe that Forte may have injured his MCL after initial worries that he possibly injured his ACL. If Forte is forced to miss time, rookie Jeremy Langford will be a popular waiver wire add this week. Meanwhile, wideout Eddie Royal left the game with a knee injury and did not return. Royal and Alshon Jeffery have been unable to stay on the field at the same time, with Jeffery only recently recovering from a calf injury that bothered him for the first several weeks of the season. - The Bills are confident that QB Tyrod Taylor will return from his knee injury during week 9. Taylor has not played since week 5 against Tennessee, with E.J. Manuel filling in under center. If Taylor does return, he will hope to have two of his top targets in Sammy Watkins (ankle) and Percy Harvin (hip/knees) available ahead of the Dolphins' week 9 visit. Watkins seems to have a better chance of suiting up, with a return to practice imminent. Harvin, however, has reportedly mulled retirement after another injury-riddled campaign. Buffalo has expressed optimism over his long-term status, though his short-term availability is more unclear. - Steve Smith Sr.'s career may have come to an abrupt end in week 8 after the veteran, who has stated his intention to hang up the cleats after this season, suffered an Achilles injury in Sunday's win over the Chargers. With Breshad Perriman still nursing a knee injury, the Ravens' receiving corps is stretched thin once again, leaving them to turn to the likes of Kamar Aiken and Marlon Brown. Smith's name had been mentioned as a possible trade target ahead of this week's trade deadline, though both he and the Ravens shot down the rumors. Baltimore will return to action in week 10. - Cardinals' wideout John Brown was active for week 8 against Cleveland, but did not play a single snap. Brown has been struggling with injuries to both hamstrings, having played through the pain in both weeks 6 and 7. With a bye week coming up, Brown should get all the rest he needs. - DeSean Jackson will look to make his return as the Redskins enter week 9 off of their bye. Jacksoin has been missing since week 1. If he can not go, Jamison Crowder will continue to see extra work opposite Pierre Garcon. 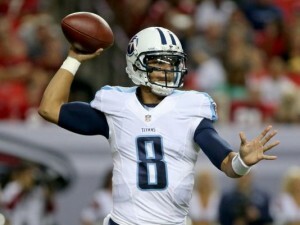 - The Titans hope to get Marcus Mariota back in time for their week 9 matchup with the Saints. The second-overall pick of the 2015 draft has missed Tennessee's last two games with a knee injury, and a return against a Saints' defense that just surrendered 6 touchdown passes to Eli Manning could be a nice spot to land in. If he can not play, former LSU quarterback Zach Mettenberger would make the start in New Orleans. Wideout Kendall Wright is nursing an MCL injury. Wright's knee was in a brace on Monday, and it sounds as if he may be in danger of missing week 9 against the Saints. Marcus Mariota will look to return from his knee injury in week 9 at New Orleans. -The Bucs were without WR Vincent Jackson (knee) and TE Austin Seferian-Jenkins (shoulder) in their week 8 win over Atlanta. The duo should have a better chance of playing in week 9 as they host a Giants defense that gave up a league record-tying 7 touchdown passes to Drew Brees and the Saints. Jackson was hurt in week 7, while ASJ has not played since week 2. Rookie QB Jameis Winston would undoubtedly benefit from the return and availability of both big targets. - The 49ers were without veteran WR Anquan Boldin in week 8. The wideout was injured during Thursday's practice, ruling him out of his team's loss to the Rams. Boldin should be poised to return for week 9, but the Niners' backfield could be an issue as the team saw two more key injuries occur in that area. Carlos Hyde (stress fracture in foot) is likely out through the team's week 10 bye, and Reggie Bush may have suffered a torn ACL in week 8, which would rule him out for the rest of the season. Additionally, Mike Davis left the game in St. Louis with a hand injury and did not return, leaving the Niners paper-thin at the position. It's possible they could expedite Hyde's return if he can practice without pain, though they were keen on keeping the second-year back shelved through their open date. It's also possible that they could bring in a free agent or two to add depth to the position. Kendall Gaskins saw the majority of the workload in week 8. - Seahawks' wideout Ricardo Lockette suffered a scary-looking concussion during the week 8 game at Dallas. Lockette took a vicious hit while covering a punt, and lay motionless on the turf for several moments before being carted off. He was able to move and communicate with team doctors and also gave the thumbs-up signal as he was taken to the locker room. Lockette had one catch on the day before he was injured. - Chargers' TE Ladarius Green left his team's week 8 loss at Baltimore with an ankle injury and did not return. Antonio Gates was able to play after recovering from a knee injury, but having both tight ends available over the last few weeks has helped further ignite the Chargers' passing game. Green's ankle was heavily taped on the sideline. Even with Gates back in the fold, a healthy Green maintains upside in San Diego's suddenly pass-happy offense. WR Keenan Allen exited the game with what the team called "muscle spasms" in his shoulder. On Monday, it was revealed that Allen actually sustained a kidney injury, and could be facing a multi-week absence. - Jets' QB Ryan Fitzpatrick sustained a ligament injury in his left (non-throwing) thumb during New York's week 8 loss at Oakland. Geno Smith took over under center, though Fitzpatrick eventually returned late in the game. WR Brandon Marshall suffered injuries to his toe and ankle. Marshall, who saw 18 targets in the Jets' loss, was able to fight through the pain and returned to the game after each injury occurred. His status should be monitored closely through the week. 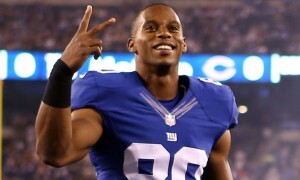 - Giants' wideout Victor Cruz (calf) remained sidelined through week 8. There is still no timetable for his return. - The Saints lost RB Khiry Robinson to a serious lower-leg injury against the Giants in week 8. Robinson's leg got caught up in the bottom of the pile, and he was taken off the field with an air-cast on his right leg. The loss of Robinson leaves Mark Ingram staring at a bigger workload, with C.J. Spiller perhaps seeing more opportunities on the ground. The team may consider bringing back veteran Tim Hightower, who was cut earlier in the season. Former fan favorite Pierre Thomas is another potential option for New Orleans. Victor Cruz remains without a timetable to return from the calf injury that has kept him sidelined all season. - Julius Thomas should be fine for week 9 as the Jaguars come off of their bye. The former Bronco, who missed the first 4 games of the year with a hand injury, suffered a mild groin strain ahead of his team's week 7 game in London. Jacksonville faces the Jets in New York. If Thomas can not play, Marcedes Lewis and Clay Harbor would see extra work. - Packers' wideout Ty Montgomery will be another name to monitor throughout the buildup to week 9. He has not played since week 6 due to an ankle injury. Montgomery is just the latest Green Bay wideout to be hit with an injury, though his chances of playing against Carolina should be much better than they were in week 8 after he was downgraded to doubtful during the week. - The oblique injury Joseph Randle is battling is only one of the concerns that the Cowboys' RB is facing ahead of week 9. Randle did not play in week 8, and in addition to his injury, the 23-year-old is facing potential league and team issues. Randle is facing a possible suspension due to his involvement in a domestic issue from February, and also wound up missing Wednesday's practice. Darren McFadden saw most of the work in the Dallas backfield during week 8. Jason Witten was seen having his ankle taped on the sideline against Seattle, but the ironman returned to the game as Dallas fell to Seahawks. Remember: The Bengals and Browns will release their initial injury reports on Tuesday, with the rest of the league following suit on Wednesday.